You might think that Nanette would get tired of interrupting our vacations with long pauses while I stop to do one of my Plein Air paintings. But my wife knows me too well for that. She enters enthusiastically into the adventure, sometimes actually choosing my subjects for me. 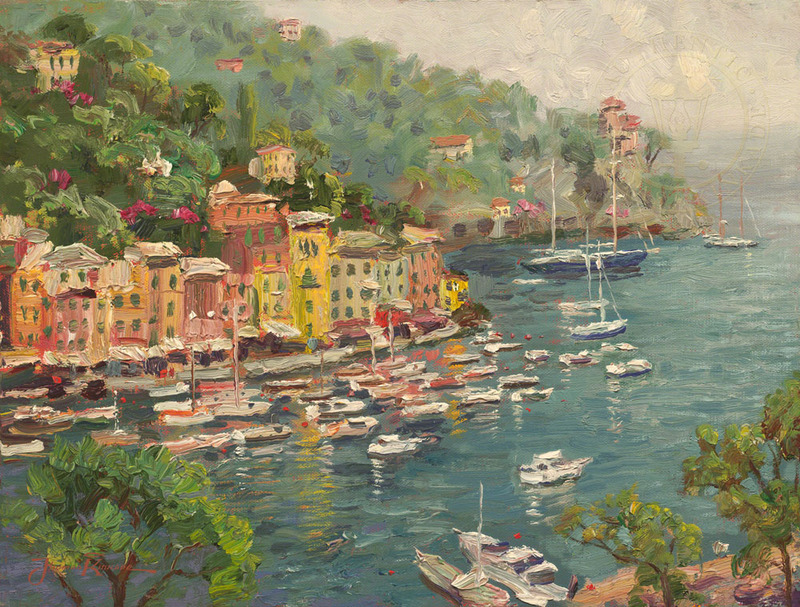 When the two of us stumbled on this view of Portofino, on the Italian Riviera, it was Nanette who said, "Oh, Thom, what a wonderful seascape that is. You just have to paint it." What stretched before us was a wonderful old harbor with a fabulous fleet of fishing boats dancing on the waves. A colorful array of ancient buildings tumbled down the hillside, almost spilling into the blue Mediterranean. The old town merges imperceptibly into the vineyards that flourish on the fertile hills.